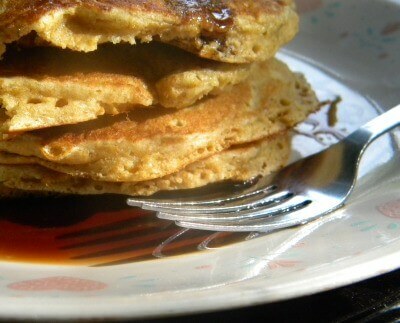 This whole wheat pancakes recipe is light and fluffy. You’ll love making from scratch pancakes with this healthy, easy recipe. Instructions for substituting other whole grains like flaxseed, buckwheat, or amaranth. Kid approved. Is it even possible to make light, whole grain pancakes? I’m talking about the kind that you don’t have to cut with a chain saw and won’t hang around in your stomach until Christmas. Sure, we all want healthy but if you’re anything like me you want healthy AND delicious. 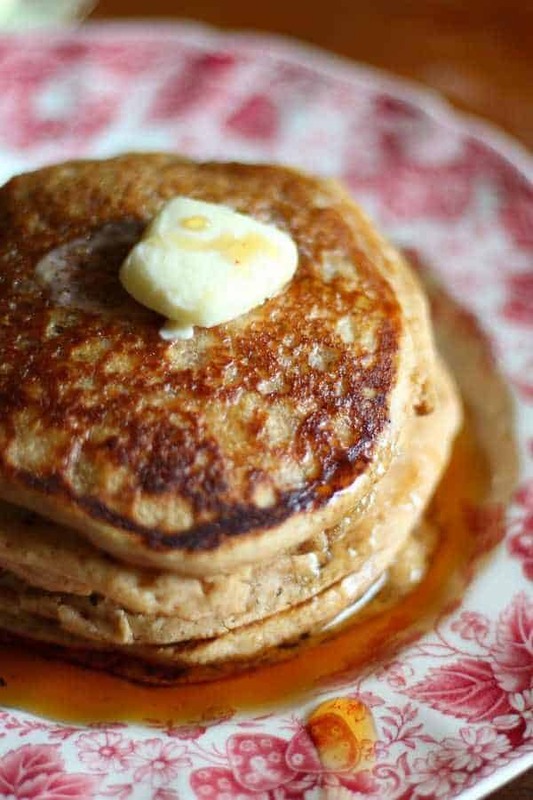 Yep, you can do it with this homemade whole wheat pancakes recipe. One thing that makes whole grain pancakes lighter is using a combination of flours, but the biggest secret of all is buttermilk. Buttermilk does what it has always done — gives baked goods a light tender crumb. My kids eat a lot, it doesn’t matter what meal it is. I found that whole grains fill them up faster and they definitely have more nutrition than cereal. One of my children, who shall remain unnamed, once ate 14 large whole wheat pancakes for breakfast — if that gives you any idea of what I am talking about. If you make a batch on the weekend and freeze them you’ll have your own frozen pancakes just like you buy at the store and it won’t have all the junk in it. The best way I have found to freeze them is to let them cool completely and then layer the pancakes with waxed paper. Freeze them in a resealable freezer bag and reheat in the microwave when you’re ready to have breakfast. These whole grain pancakes freeze well for up to three months but I have forgotten about them in the freezer as long as six months and they were fine. These are pure country, y’all. That nutty, wholesome, whole wheat flavor really shines here — and it will make you think of red checked table cloths, lazy Saturday mornings, and roosters crowing even if you’ve lived all of your life on the 18th floor of a big city condo. Grain Variations on this Whole Wheat Pancakes Recipe. A cast iron griddle sits on top of two burners and allows you to cook several pancakes at a time. because of the cast iron everything cooks evenly. I love this Lodge griddle — It’s the one I have and I think it’s the perfect size. Another thing I’ve enjoyed over the years is my wheat grinder. I can grind fresh wheat flour whenever I want and you wouldn’t believe the difference in flavor! I have had a Blend-Tec for 20 years… the SAME Blend-Tec! This is my favorite recipe, especially for cold weather. Hot, whole wheat pancakes with melting butter and warm maple syrup just taste cozy and comforting when the wind is howling outside. Give them a try and if you like this recipe please consider giving it 5 stars. 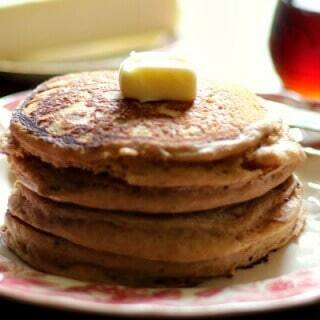 Light, melt in your mouth, whole wheat pancakes with a nutty flavor. Perfect with a splash of maple syrup. Mix dry ingredients in one bowl and wet ingredients in the other. Add the two together and stir quickly -just until well blended. The batter will be lumpy. Spoon 1/4 cup size ladles of batter onto a hot griddle. When bubbles form in the top flip the pancake and cook until done. This makes about a dozen pancakes. They freeze and reheat really well. Thank you so much for this recipe Marye! I used the whole wheat/buckwheat/amaranth combo and it was perfect! Added some chia seeds to the batter for an extra boost of nutrition! This recipe is a keeper!!! I have been looking for a healthier pancake recipe. This one looks delicious and very creative. My kids have always gone cuckoo for pancakes. I like the spices you added for flavor. Wonderful to see a healthy recipe that kids would love! Your pancakes look fabulous and I’m sure they taste that way too! You can’t go wrong with thick, fluffy pancakes! These look amazing! Pancakes are always so versatile, which is great because you know every kid is going to be difficult with their order! 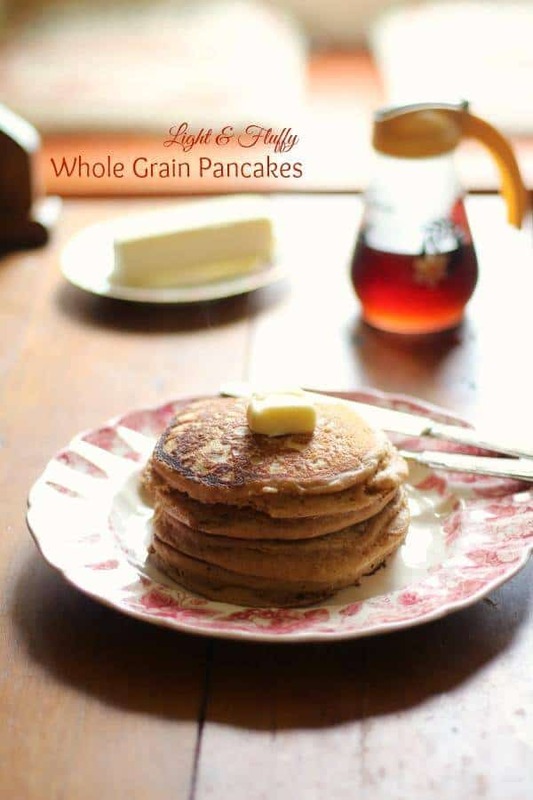 Love the idea of using whole grains instead of white flour. 🙂 these are light, too. I think that makes them more appealing to kids. I like making food for my daughter that I know has some nutritional value to it, and I think these definitely qualify. your homemade pancake looks appetizing Merye… And love the color shade at first picture above..gorgeous..! Pancakes are just awesome! I like experimenting with different flour combos! Great recipe Marye, I could go for a stack right now. I find I can get away with healthier flours in pancakes and the kids don’t even know the difference. Might have something to do with the puddle of maple syrup on their plates! Can’t beat a puddle of maple syrup! Love homemade pancakes and these look FABULOUS and healthier!